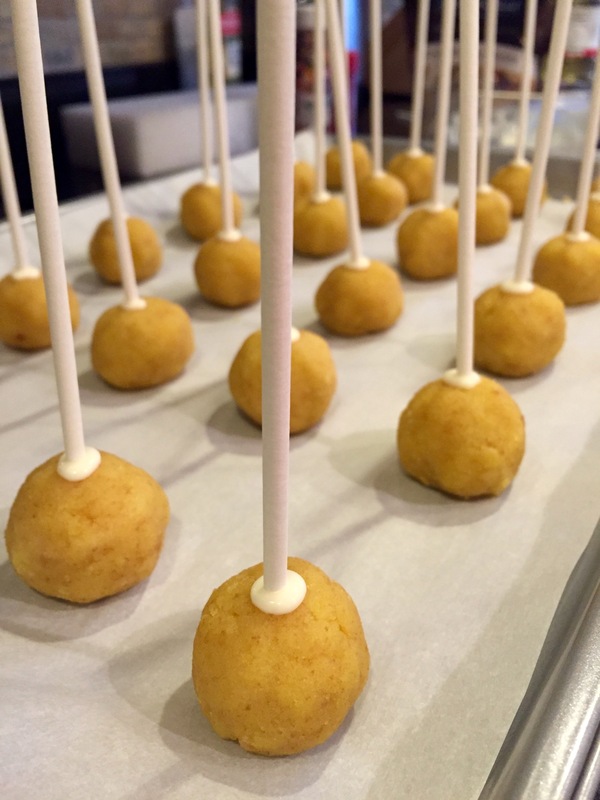 Oh, the ever so popular cake pop. Seriously. You see these everywhere and I’ve been wanting to make some for the longest time. Well, that time has come! And they are super easy! Time consuming, hell yes! But easy and beautiful and delicious? Yes and yes and yes 🙂 Honestly, I probably won’t ever make them again. I’d much rather make a cake and frost and decorate that, then do all these steps. But, at least I tried it once! First, make the cake. I made cupcakes using the Lemon Supreme cake mix. It helps to do this the day/night before making the cake pops so you have more time and it lets the cake cool and rest. Then, once your cake is cooled completely and you are ready to make the cake pops, gather all your other supplies and ingredients. With your hands, crumble the cake into a large bowl. Stir in about two scoopfuls of frosting, adding more until the crumbs stick together. I used about half of the 16 oz. can of frosting. Form balls as big or as little as you like, placing them on prepared cookie sheet. Refrigerate for 15 minutes. Cover about a half inch of a lollipop stick and place in the center of a cake ball, only going about halfway in. 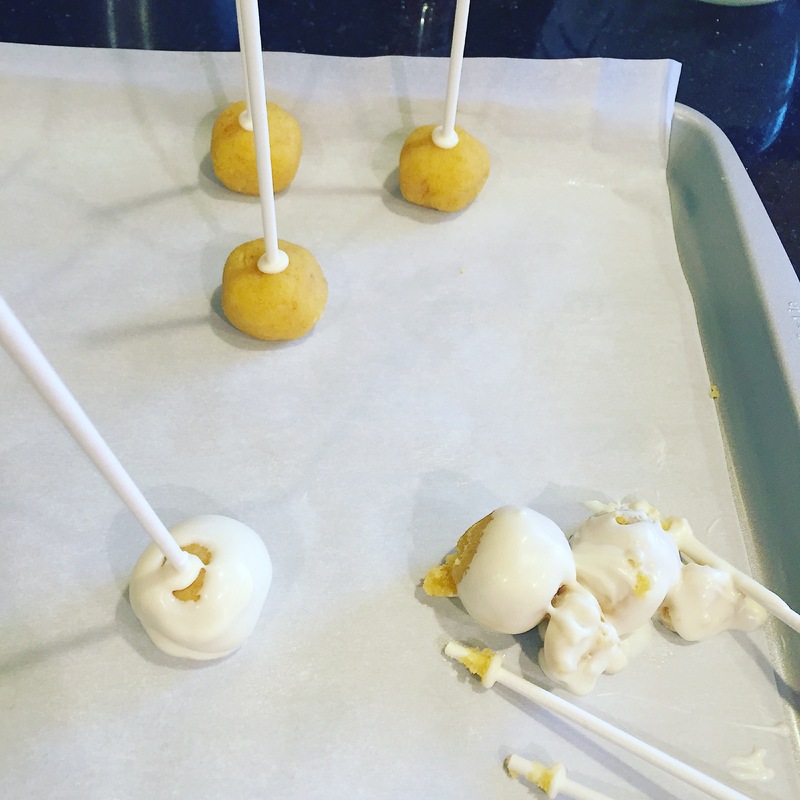 Continue until all your cake balls have sticks in them and place in the refrigerator for another 15 minutes. Melt more chocolate. This is for covering all your cake balls so make sure it’s enough. 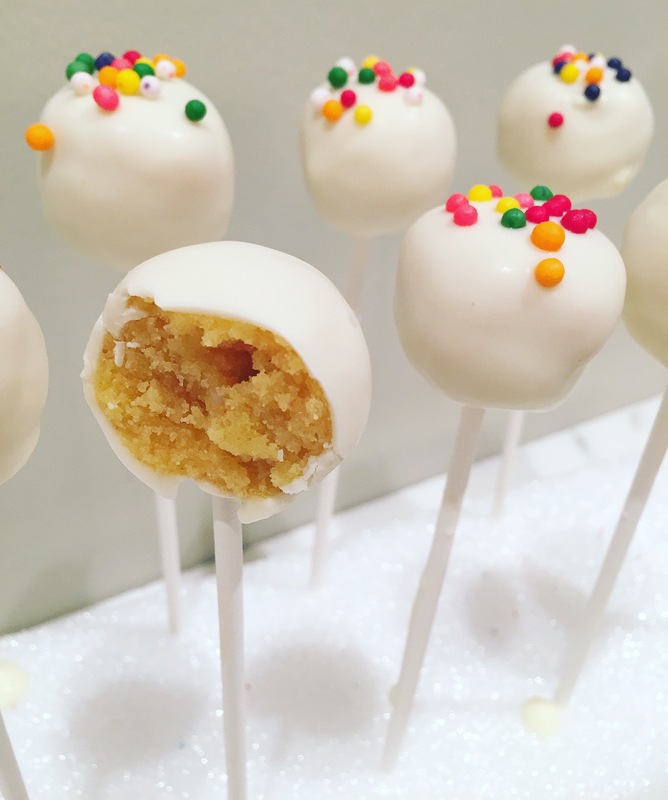 I used about 10 ounces of white chocolate and covered about 13 cake pops. Tip: Once chocolate is melted, stir in about a teaspoon of vegetable oil for a thinner, smoother, shinier coating. Pour melted chocolate into a tall glass for easy dipping. Carefully, dip each cake ball into the chocolate. 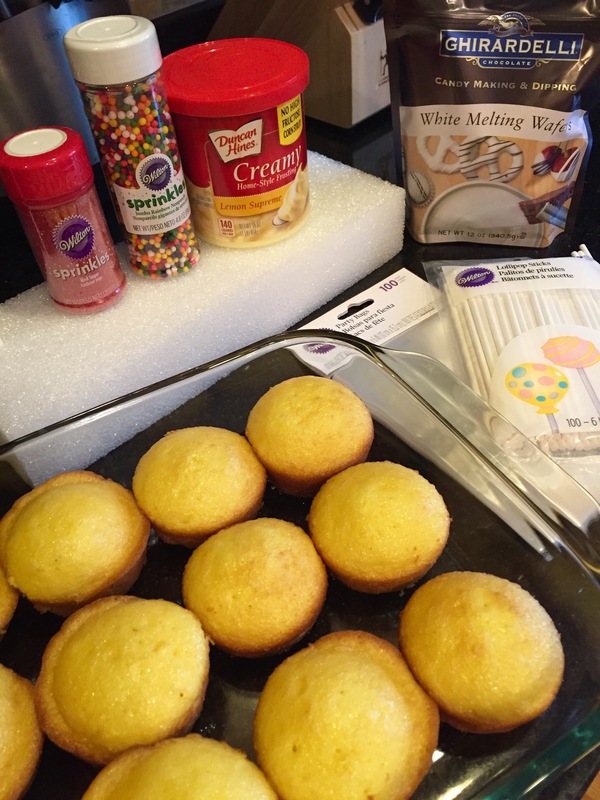 Immediately put on the sprinkles you are going to use and then stick the cake pop into styrofoam to dry. Store covered at room temp or in the refrigerator . Enjoy!